What is the Public Sector Equality and Human Rights Duty? 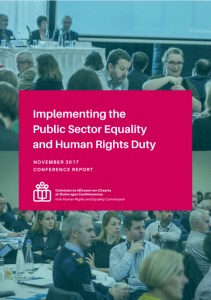 All public bodies in Ireland have responsibility to promote equality, prevent discrimination and protect the human rights of their employees, customers, service users and everyone affected by their policies and plans. This is a legal obligation, called the Public Sector Equality and Human Rights Duty, and it originated in Section 42 of our founding legislation, the Irish Human Rights and Equality Act 2014. Following two major conferences on the Duty, the Commission compiled the insights provided by keynote speakers and the ideas and learnings shared at the various workshops into this conference report. A framework of equality and human rights values: Autonomy, Democracy, Dignity, Inclusion, Social Justice. This was developed by the Equality and Rights Alliance to underpin equality and human rights in the context of the Public Sector Equality and Human Rights Duty in Ireland. The PANEL framework of principles: Participation, Accountability, Non-discrimination and Equality, Empowerment, and Legality. This approach was developed by the Scottish Human Rights Commission to underpin the implementation of a human rights-based approach as part of its equality and human rights impact assessment resource. The FREDA framework of values: Fairness, Respect, Equality, Dignity and Autonomy. This approach was developed in the UK health sector to support the NHS to use a human rights-based approach to improve service design and delivery.